This 29 plasmid kit contains reagents for generating transgenic nematodes, including C. elegans and C. briggsae. The technique has been validated extensively and the Jorgensen lab has therefore decided to release the reagents prior to publication. Please cite "C. Frøkjær-Jensen and E.M. Jorgensen, unpublished reagents" if you use the reagents in a publication before we publish the method. The miniMos transposon is a modified Mos1 transposon that can be used to generate transgenic nematodes, including C. elegans and C. briggsae . The Mos1 transposon has been modified to allow transposition with cargo at high frequency and at high fidelity. 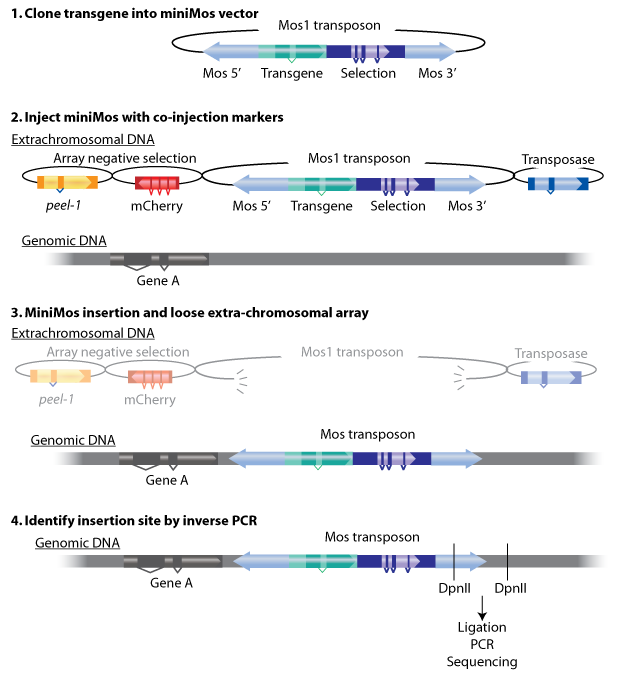 Transgenes inserted into the miniMos transposon can be integrated in the genome as a single copy by injection or by heat-shock. Insertions are selected for with genetic markers ( unc-119 ) or antibiotic markers (NeoR or PuroR) and the exact insertion site can be determined by inverse PCR. This kit consists of cloning vectors that are compatible with three-fragment Gateway cloning and with standard restriction cloning into multiple-cloning sites. The kit includes co-injection markers (Mos1 transposase helper plasmid, negative selection marker peel-1 and mCherry fluorescent markers), cloning vectors, a recombineering cassette and a set of positive control vectors. More information on these plasmids and kit, as well as protocols for insertion and mapping insertions, can be found at Wormbuilder. "The plasmid kit used for generation of transgenic nematodes was a gift from C. Frøkjær-Jensen and E.M. Jorgensen (Addgene kit # 1000000031)"